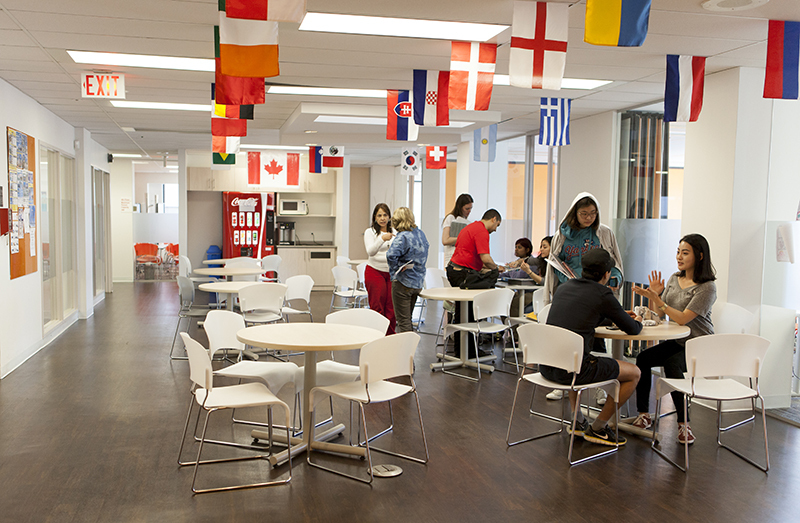 Learn English in Toronto at our partner school, EC Toronto (formerly known as LSC). This school has magnificent facilities and is located in the heart of Toronto and thanks to the metro, it is very well connected with the rest of the city. The intensive courses in Toronto consist of 20, 24 or 30 lessons per week. Classes have a maximum of 15 students. Minimum course duration is 1 week. Our partner school in Toronto offers the intensive course at 7 different levels. The entrance test determines your level of English and the class you will be in. The lessons focus on listening, reading, writing and most importantly speaking. During the classes in the afternoon of the 30 hours course, extra attention is paid to a specific subject as vocabulary, fluency, conjugating verbs or TOEFL or IELTS preparation. The summer residence opens from 05/05/2019 - 17/08/2019. A twin room can only be booked by two people who travel together. For a supplement for € 14 per week you can book a private bathroom. Airport transfer on arrival at Toronto Pearson International Airport. The teaching materials are not included in the fees. Minimum age is 16 all year round. For under 18’s, a parent authorisation form must be submitted; single room homestay and airport transfers must be booked. No supervision is provided. Students should also provide a Custodianship Letter if requested by the Canadian Embassy. This may be arranged for a fee of approx. € 104. Students aged 30 years+ can study exclusively with other students of the same age group. You will follow the Intensive course with other students of your age (minimum 30 years old). The requirement for this course is a level of Pre-Intermediate to Upper Intermediate. The Cambridge Exam course prepares you for the Cambridge exam and has a duration of 8 or 12 weeks. The course consists of 20 or 30 lessons per week in classes with a maximum of 15 students. The prices of the Cambridge exam course do not include the exam fee (€ 345). Prices of the Cambridge exam course include an extra week of accommodation due to the exam date. This course prepares you for the IELTS exam, for example by giving you practice exam papers. The course consists of 20 lessons per week in groups with a maximum of 18 students. The minimum course duration is 4 weeks and the maximum course duration is 12 weeks. For the best results, the language school recommends to choose either 6 or 12 weeks, depending on the level. The exam takes place on a Friday and is made on the computer (at the language school). You need to register for the IELTS exam in advance. The prices of the IELTS course do not include the exam fee. This course prepares you for the TOEFL exam, for example by giving you practice exam papers. The course consists of 20 lessons per week in groups with a maximum of 18 students. The minimum course duration is 4 weeks. For the best results, the language school recommends to choose either 6 or 12 weeks, depending on the level. The exam takes place on a Friday and is made on the computer (at the language school). You need to register for the exam in advance. The prices of the TOEFL course do not include the exam fee. If you would like to end the course with a TOEFL test, please contact StudyTravel to determine the best starting date for you. The academic year is a study programme of 24, 32 or 36 weeks. The academic year course consists of 20 or 24 lessons per week in groups with a maximum of 15 students. Students can join an exam preparation course as part of the academic year and this way prepare for either the Cambridge, IELTS, TOEFL or TOEIC exam. Academic Year includes Cambridge, TOEFL, TOEIC or IELTS exam preparation. The one-to-one course is designed for those who want to optimise their study time. The aim of the one-to-one course is to offer a fully personalised method of teaching designed to meet the specific student's needs and desires. As the classes are private, the student will be able to choose the schedule and content. 20 hours per week. Take part in the daily life and share the experiences of an English-speaking family: a great opportunity to immerse yourself in the local life of Toronto and practise your English in a friendly and informal atmosphere. Students can stay in a single or twin room with half board. With an executive family, students can stay in a single room with half board with a private bathroom. The summer residence for students in Toronto is a former 4-star hotel centrally located at about 20 minutes by public transport from the school. Your stay is in single or double rooms with a private bathroom and includes breakfast. There are no cooking facilities in the residence. You can choose to stay in one of the apartments together with another student of the language school. The Apartments are located in Davisville Village, a central location in midtown Toronto. The Davisville Village Community is a popular neighbourhood with excellent recreational facilities and shopping, as well as an active nightlife that includes bars, restaurants and movie theatres. The buildings offer spacious, well-maintained apartments with generous closet space. The pool and lounge area provide the perfect opportunity to relax and recharge. The award-winning landscaping provides a park-like setting for residents to enjoy. All apartments feature comfortable and quality furnishings, and plenty of storage space. Laundry is available on-site. Each apartment includes two bedrooms and one or two bathrooms (you can book a shared or private bathroom) a fully-equipped kitchen with major appliances and kitchenware. Living area with sofa set, dining area. The single room with shared bathroom includes a single bed, study desk and a lamp. The single room with private bathroom includes a double bed, study desk and a TV with exclusive Netflix subscription.